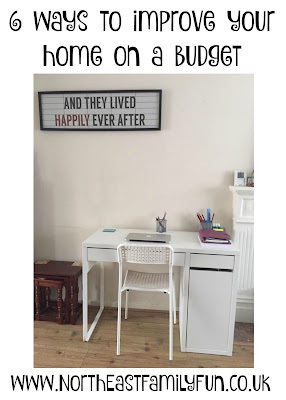 As well as saving for our holiday abroad, we've also created a list of things we would like to do to the house this year and are slowly buy surely ticking them off. 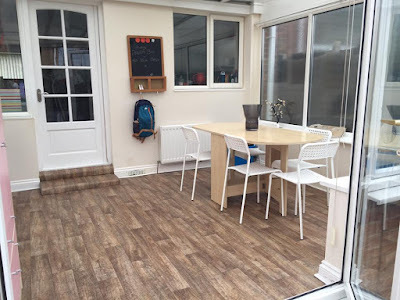 We have sorted out our conservatory/dining room, I have a new office space and our living room has a new rug which we LOVE. Next up are new wardrobes and a fancy computer chair from John Lewis. We are spreading the jobs out throughout the year and trying to tick one from the list every month to spread the cost. If you are thinking of doing some work on your home but wondering how you’re going to do it without breaking the bank? Don’t worry! There are plenty of ways you can improve your home on a budget - here are six of our best suggestions. Ensure your front lawn is free from weeds and debris, and give the door a fresh lick of paint. While you’re at it, why not consider repainting the outside of your home or the window frames? Just make sure you use industrial paint (available from places like Rawlinspaints.com) so it withstands the weather. If your budget’s too tight for a complete overhaul, why not repaint the cabinets? Repainting will cleverly hide any nicks and stains in the doors, and a new set of handles can drastically improve the sense of quality in the finish. You can even update your appliances without spending money: did you know that most dishwashers are black inside? Simply unscrew the front panel, flip it over and refasten it back in place: it might fit better with your paintwork if white appliances were looking a little dated. Your home will feel more spacious if there’s less ‘stuff’ getting in the way, so get clever about your storage. There’s a great affordable range from Ikea if you want to snap up a few pieces. You’ll find you have more room leftover for the stuff that makes your house a home, like entertaining, relaxing and hanging out with your family. A whole new bathroom suite is going to set you back, so give it a deep clean instead using household materials. Fill a bag with white vinegar and submerge the shower head in it overnight, then rinse with hot water to remove lime scale. For the shower doors, mix a few drops of distilled white vinegar to a cup of baking soda to make a paste: smear it all over the door, leave for an hour, and wipe it off with a microfiber cloth to make it gleam. Good as new! Natural light will improve your home - it makes it more pleasant to be in and will boost your mood too. Trim back trees in case they’re preventing light from entering, install skylights if you can afford to, or spend a small amount of money changing the bulbs you’re using. Higher wattage bulbs will brighten a room, but you can also cosy up corners by using a warm, lower wattage bulb too. Scour local markets, charity stops, antiques fairs and online sites such as Gumtree and eBay: you’ll often find pieces that are in great condition or just need a little TLC. Updating bits and pieces throughout your house won’t cost you too much if you stay away from big-brand names, and will have a big difference on the way you use and enjoy your home. Will you be spending time (and money) on any home improvements this year?